The daily condition reports on the President’s health reached anxious readers around the nation and around the world. In order to be disseminated so widely, each bulletin went through a number of physical incarnations as the text moved from author to reader. Each bulletin was hand-written by one of Garfield’s physicians…. 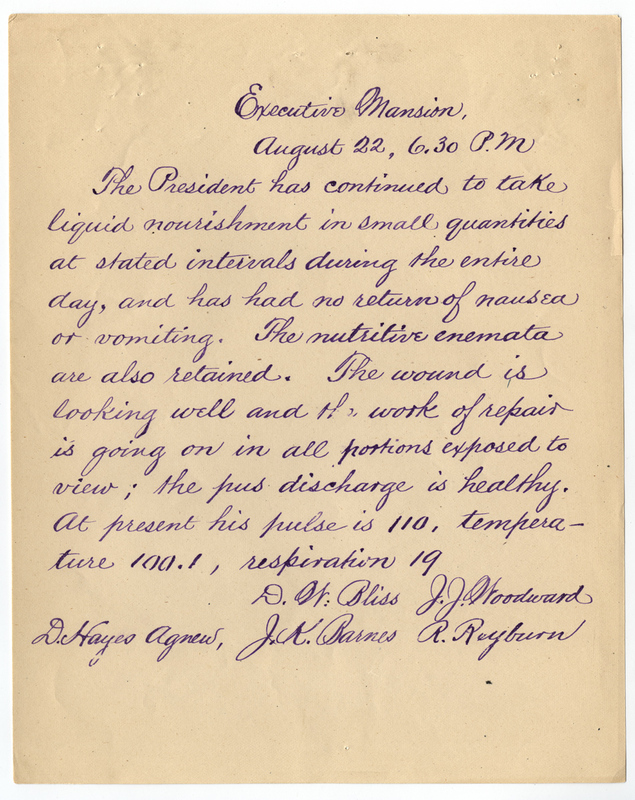 Original manuscript of the bulletin dated 6:30 P.M. August 23, 1881. Quickly converted to a printed leaflet and distributed locally…. The printed version of the 6:30 P.M. August 22, 1881 bulletin. Then the text from the leaflets was transmitted by telegraph—a recent invention of the day—to newspapers around the country and the world, whose editors quickly reprinted the news for their readers…. A cutting from New York Herald including the text of the 6:30 P.M. August 22,1881 bulletin. From those crowds nearby, and from readers far and wide, the bulletins resulted in outpourings of grief over the attempted assassination and the aftermath. 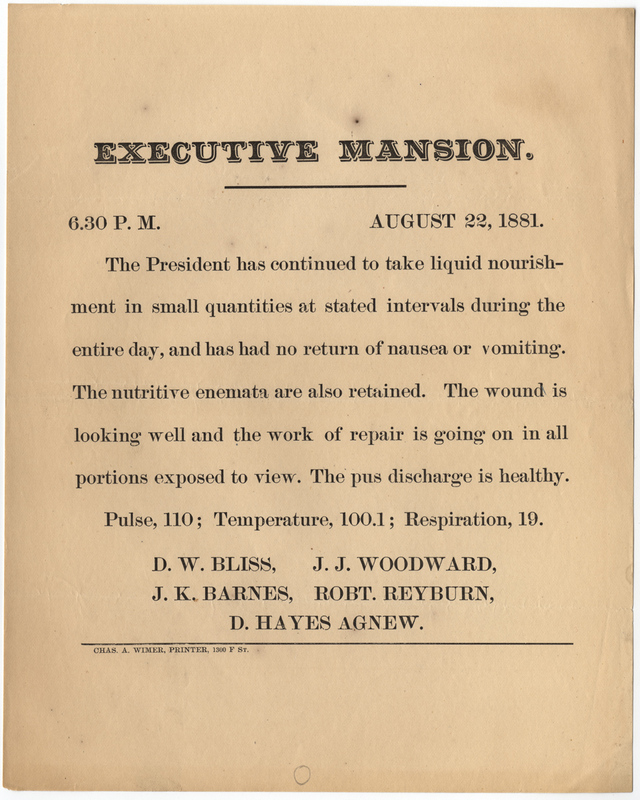 Letters by the bushel basket came daily to the White House offering advice on various forms of treatment, and well wishes to the President, his wife, Lucretia, and, their children. Jeffrey S. Reznick, PhD, is Chief of NLM’s History of Medicine Division and author of two books and numerous articles on the cultural history of war and medicine. Lenore Barbian, PhD, is Associate Professor and Anthropology Program Director at Edinboro University of Pennsylvania. She is author of numerous articles, including “Remains of War: Walt Whitman, Civil War Soldiers, and the Legacy of Medical Collections“, co-authored with Jeff Reznick and Paul Sledzik, which received the 2013 best article award from the Archivists and Librarians in the History of the Health Sciences (ALHHS).